It’s not always easy to find the best outdoor basketball. It’s even harder to find a good outdoor basketball. Not all outdoor basketballs are alike. You’ve got to look carefully at each one. I’ve creating this listing of the best outdoor basketball options that you can get today. These are all great basketballs that are easy to play with and offer nice looks but it’s even more important for you to look at how these balls are made and how they feel. I have created a sensible listing of five good outdoor basketballs to check out. As you will notice, the designs and colors of the balls aren’t the only things about them that make these balls different from one another. Spalding has been in the business of producing basketball equipment for over 100 years, and in that time have developed plenty of high quality products. 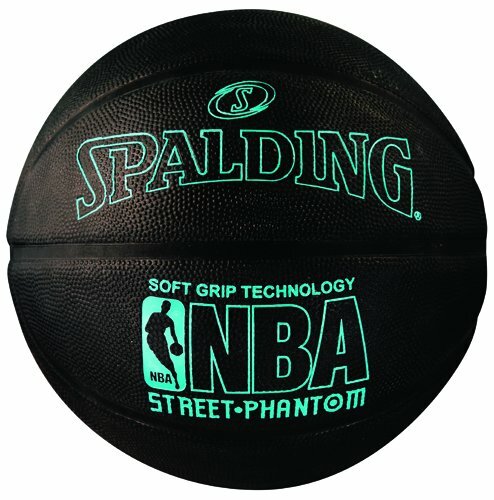 As far as outdoor basketballs go, the NBA Street Phantom Outdoor Basketball is one of them. 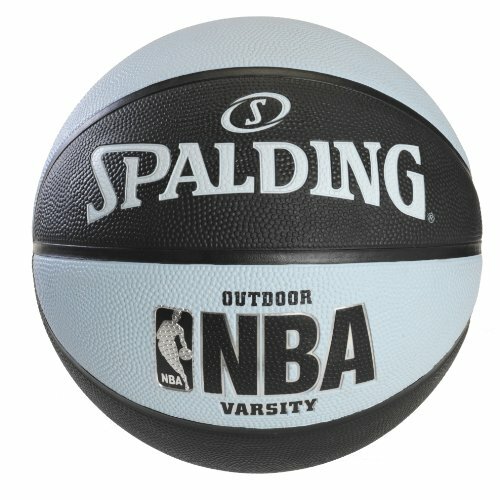 Spalding, the company that makes the official regulation basketball used by the NBA, has made this unique outdoor basketball with a flashy design. It features a black body with a neon green tone. You can also order this with a neon blue or yellow tone or even with a silver print. All options have the same primarily black body. This 29.5-inch ball is designed to the exact specifications the NBA has for a ball’s size and weight. It has a wide channel design that helps you to grab onto the ball with ease. The channels do not interfere with the rest of the ball’s design, and it excels in most of the important features of an outdoor basketball. The outdoor cover has plenty of raised dots that create a strong grip due to the durable soft grip technology used by Spalding in its construction. For some shooters, however, the ball may have too much grip, which can affect your shot if you are accustomed to shooting balls with less grip. The texture is soft enough to keep your hands from feeling rough or fatigued while using the ball. The rubber body is flexible enough to handle the stress it experiences while you dribble the ball. It also has a hard surface that bounces well. The bounce is also consistent, though it is perhaps bouncier than a genuine leather basketball. As with most rubber balls, the Phantom Outdoor Basketball is very durable, able to withstand extensive use on a variety of surfaces. The outside surface still retains its soft texture no matter how hard you dribble the ball. You will have to watch for how well the ball is inflated though. It can deflate depending on how often you use it. Still, the air intake hole is tightly secured and allows you to quickly fill up the ball with air as necessary. It gives you a comfortable body for the ball without being rough as you are using it. For those who are looking for a ball with a more realistic look, Spalding has a more professional option for you to play with. The company has made this basketball in three sizes. You can order an official 29.5-inch ball, an intermediate 28.5-inch option or a 27.5-inch ball for youth use. It is designed with street use in mind and especially does well on blacktop surfaces. It can bounce well like any other indoor basketball and will not be easily influenced by any cracks or other impurities found on a playing surface. The soft rubber material is very rigid. It does not burst apart quickly. Often, this impacts the feel of the ball, while benefitting its durability, and this ball is no exception. It will also resist all forms of pressure while on the court. The surface still offers a leather-like feel but is engineered to handle all kinds of tough outdoor surfaces. The outside cover is made with plenty of raised dots on its surface. These dots help to give you a better handle over the ball. The cover also does well with managing moisture as it allows water to smoothly slide off of its body. The wide channel body on this ball also provides you with a strong grip. It helps you to catch the ball and keep a clear handle on it as it bounces up and down. It also manages to hold onto its air quite well. The air intake spot is visible enough to use a standard air needle in but small enough to ensure any air that is let out is minimal. For handling, however, the bounce is far more true and consistent when compared to other rubber balls, which can often be inconsistent or far too bouncy. Considering the quality of this ball when compared to similar balls, it provides great value, making it a worthwhile purchase for many players. 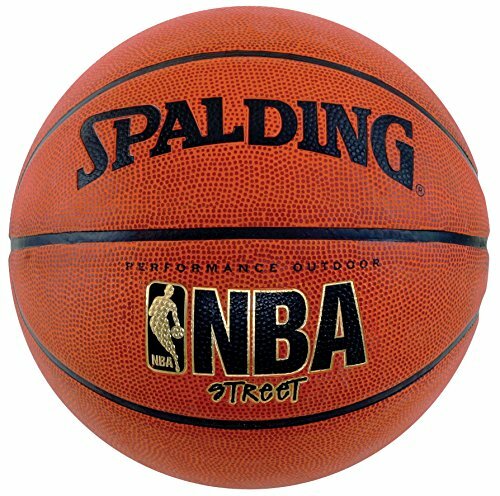 Spalding has made this outdoor basketball in a number of colors. It can be found in a blue and green or black and pink color as well as four other options. Depending on the color you choose, you can get a 28.5 or 29.5-inch ball. The 29.5-inch ball option fits all NBA standards for finding a quality ball. It is designed with outdoor play in mind and has a sturdy rubber cover. There’s a reason they’re the official supplier of the NBA. This ball is, quite simply, a very good all-round rubber basketball. The black channels on the ball are relatively slim but still keep the cover together. The rubber surface has a soft feel while the raised dots around the ball are bunched up together quite well. They will not fade, fall off or suffer from too much abrasion over time. It feels exactly as you would anticipate for a rubber basketball, with no unwelcome surprises. The bounce on this ball is identical to what you will find on a traditional indoor basketball. It can respond to the force you apply onto it quite well. Still, it can be very sensitive to even the smallest bit of pressure. This is especially critical when you are filling it up with air as the ball might bounce far too high if too much air is added. Also, this does well on a variety of surfaces. It can handle blacktop and composite surfaces and even small and smooth grass surfaces. It should not be placed on extremely sharp surfaces though as it could puncture through the ball and tear apart its regularly sturdy rubber cover. The Spalding Varsity Outdoor Basketball is the ideal outdoor basketball for many players, with the cover enabling the ball to remain in its original condition for endless sessions, whether on concrete, bitumen, or synthetic surfaces. The ball manages to maintain solid feel and grip, despite its rubber exterior. Overall, this is a great all round ball for less advanced players, and will serve its purpose for years. 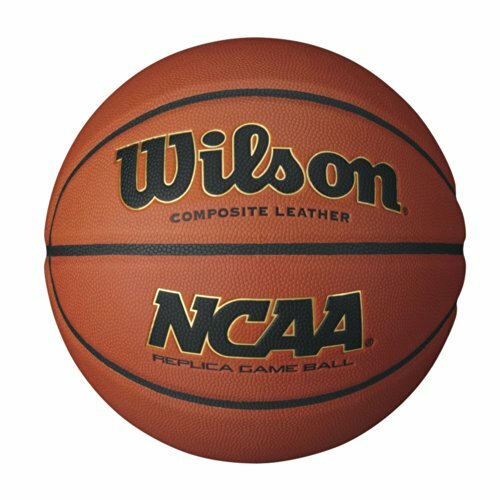 Wilson, the company behind the official basketballs used in NCAA men’s and women’s college basketball competition, has made this next outdoor basketball in 28.5 and 29.5-inch sizes. The ball is designed as a replica of the official NCAA ball but is meant for outdoor use. It is made of a composite leather material, meaning it feels better than a rubber basketball, but is still able to stand the test of time when used outdoors. It has laid-in channels on the exterior, which provide it with solid gripability, and an increased ability to handle the ball. The Cushion Core Technology feature creates a bounce that is consistent and responds well to all your actions. It also keeps the ball soft without feeling rough. This ball can be used in various situations – it is suitable as a shoot-around ball, but can also stand up to repeated use in outdoor-games. As with all composite leather balls, it does suffer somewhat in feel. It certainly doesn’t feel as soft and comfortable in your hands as a leather ball such as the Wilson Evolution, but as far as outdoor balls go, the composite material on this ball works well. The black recessed channels are not too deep. This allows for enough space for a careful grip while dribbling the ball. These also allow water to move through the ball properly in the event it gets wet for any reason. The water will not pool up or get stuck anywhere around the ball as you are using it. It can be seen as a ball which lacks the best features of both leather and rubber basketballs, or as a ball which manages to combine most of the benefits of both. For most players, it will be the latter, as this is one of the best composite leather basketballs on the market. If you are the kind of player who relies heavily on difficult handling maneuvres, however, the inconsistent bounce may prove a major flaw. 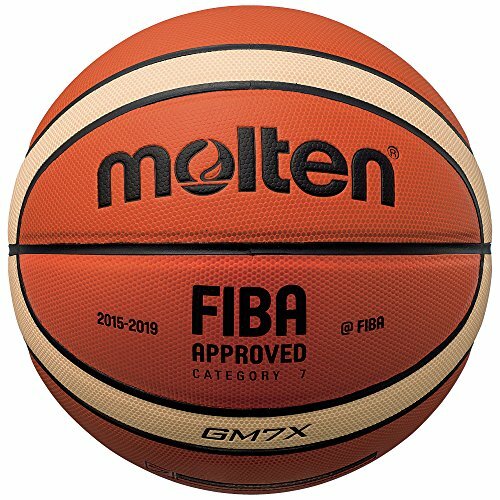 Molten is perhaps not as renowned as a brand like Spalding or Wilson, but they can certainly produce a very good basketball. This last option for an outdoor basketball is a FIBA-approved ball that features twelve panels. A few of these panels are slimmer white surfaces that pair with the traditional orange surfaces around the rest of the ball. The black channels are all of the same depth and width, thus providing you with a consistent surface to grab onto. The white panels especially help to make the ball a little more visible in a variety of conditions and court settings. This is available in sizes 5, 6 and 7. These are sizes recognized by FIBA as being official sizes for junior, intermediate and official game play. The individual pebbles on the surface are arranged in a consistent pattern. They are made in the same shape to ensure every spot on the ball is covered. This creates a uniform look and feel so the ball will have the same touch to it no matter how you grasp onto it. Normally, these pebbles sit individually around the surface of the ball. Molten have created this cover so that the pebbles join uniformly with one another. The synthetic cover uses a rubber-like body that is sturdy and yet offers a comfortable leather-like surface. It does not add fatigue to your hands as you use it. It will also last for a while without tearing up. This can be used on a variety of surfaces. You can use it on composite and blacktop surfaces outdoors as well as on a traditional wooden court while indoors. The butyl bladder expands well and keeps the ball inflated well. It does add too much pressure onto the outside of the ball, thus ensuring that the synthetic cover continues to stay intact. Occasionally, this ball can seem quite bouncy, though in general it bounces very consistently. Overall, this is a very good basketball. There are no major flaws, and it performs quite well on most of the major factors which need to be considered in your purchase. As you buy an outdoor basketball, you have to ensure that you are ordering one that is made with a proper size. A 29.5-inch ball is a standard regulation model. Intermediate balls are for women’s games while smaller youth balls can be found in many cases. Look at how the ball is made. Rubber is the most commonplace material used although some composite items might mix rubber with leather. Rubber is prominent for offering a sturdy body that is rigid and will not tear up while in use. The texture of the ball must be checked carefully. A good texture will come with a series of raised bumps. These bumps will add a good grip and are a necessity when you consider how rubber itself does not have a strong grip if it is smooth. Check on how the black recessed lines on the ball are made. Not all balls will have pebble grip dots on these features. These dots will add a nice grip to the ball but should be checked based on how well they are organized around the ball’s surface. The importance of this factor may depend somewhat on your level of ability as a player. For new players, the feel may not be a significant issue as they attempt to develop the fundamentals of the game. For more experienced players, though, the way a basketball feels is the most important factor separating it from other balls. A ball with a good feel is easier to shoot, handle, and gives you greater confidence in your game. Particularly with outdoor basketballs, bounce is a major factor. Ideally, you want a ball which bounces like a leather ball – consistently, and at the height you expect. Often balls made of composite materials can bounce inconsistently, while rubber balls can be very bouncy. This makes it very difficult to perform maneuvres in which there is very little difference between success and embarrassment. Another factor which is even more important for outdoor basketballs, durability should have a major influence on your decision. Often, outdoor balls are subjected to use on fairly rough surfaces such as asphalt, which can cause rapid deterioration on inferior balls. The best composite-material balls can withstand significant use on these surfaces, while rubber balls tend to last even longer. Ensure the ball you purchase is not going to fall apart at the first sign of adversity. What is the Best Basketball for Outdoor Use? Particularly for the competitive basketballer, it is important that your ball will allow you to best execute your skills, even in the absence of a real leather exterior. The ball must feel close to a genuine leather basketball, bounce consistently, and be durable enough to withstand tough conditions. There are many balls which are able to achieve most, if not all of these features, and the five mentioned are all high quality basketballs. Perhaps the pick of the bunch, though, is the Wilson NCAA Replica basketball. This ball resembles a true leather ball as closely as possible, while still retaining high levels of durability. It makes for the best choice you can find when getting a quality basketball that you can use outdoors. Whichever ball you choose to purchase, make sure you know what you are getting, and that it will suit your needs as a basketballer.